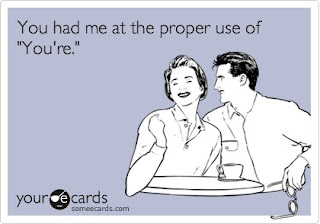 I’ve noticed a lot of grammar posts and articles in the blogosphere lately. I’m not really sure why it’s become a point of focus, but we ladies here at Furia Rubel are certainly glad that more business-minded people are paying closer attention to the importance of proper grammar. In the age of text messages, tweets and social media posts, it seems that everyone is trying to find the quickest way to communicate a message. Unfortunately, grammar has taken a back seat in our fast-paced world. The Wall Street Journal recently published an interesting article with an interactive quiz to test your grammar skills. The article discusses ways hiring managers and business people are working to combat bad writing and grammar usage in the workplace. The author spoke to generational and human resources experts who noted that the grammar gaffes are being blamed on the 20- and 30-something employees at an organization. I tend to think that anyone can commit grammar mistakes regardless of their age. One controversial grammar rule is “the Oxford comma.” It is the extra comma put before “and” or “or” in a series of nouns. Many argue that without it, the meaning of a sentence is completely altered. Those of us that adhere to AP Stylebook guidelines generally tend not to use it in the majority of our business writing. The author highlights another typical grammar mistake with this example: “He expected Helen and I to help him," instead of “Helen and me.” To test if you're using the rule correctly, you should be able to delete the other subject from the sentence and still have it make sense. To read more about this rule, go to The Guide to Grammar and Writing. Perhaps the more we discuss grammar and encourage good writing and communicating skills, we can overcome the commonly-used grammar faux pas. To read more about some typical grammar gaffes, check out the article on WSJ.com. Amanda, here's one for you. What's the current rule on possessive after a double s? For example, is it Ross's marbles or Ross' marbles? I'm thinking it's the former.